At the WWDC 2010 on Monday, Steve Jobs CEO of Apple finally unveiled the price details of the new Apple iPhone 4.The new Apple iPhone 4 comes in both 16GB and 32GB models.Both models of iPhone 4 will be available through AT&T by 24th of this June 2010. 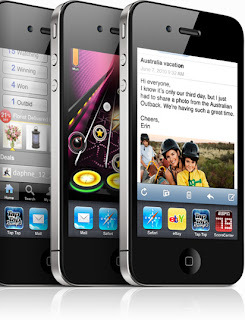 The new Apple iPhone 4 with 16GB capacity will be available for a price tag of $199 where as the 32GB model of Apple iPhone 4 costs $299 both comes with a fresh two-year agreement.Both models are available in white or black shades. The pre-order for Apple iPhone 4 will starts on June 15th and the sale by June 24th.At first the new iPhone 4 will be available only in five countries including United States, France, Germany, the UK, and Japan.Apple also said that the new iPhone 4 will be available in 88 countries by late September this year. Tags:-Apple iPhone 4 price details, Apple iPhone 4 price, Apple iPhone 4 availability, Apple iPhone 4 release, Apple iPhone 4 pre-order dates, Apple iPhone 4 features, Apple iPhone 4 models, Apple iPhone 4 shades, Apple iPhone 4 storage capacity, Apple iPhone 4 images, Apple iPhone 4 release, Apple iPhone 4 availability, Apple iPhone 4 launch in Us, Apple iPhone 4 US release, Apple iPhone 4 worldwide release.